For a 6 inch finished nine patch blocks (in the quilt), you need to cut 2 1/2 inch squares. (More sizes at the bottom of the page.) You need five dark 2 1/2 inch squares and four light 2 1/2 inch squares for each nine patch. Your lights and darks can all be different or all the same, but they must contrast with each other. 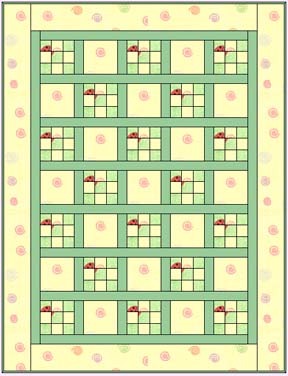 Easy Nine Patch Quilt I made this page years ago, 1997 to be exact, to help a friend to make a few baby quilts in a hurry. I just found it burried on my web site, updated it a little, and am now sharing it with you. 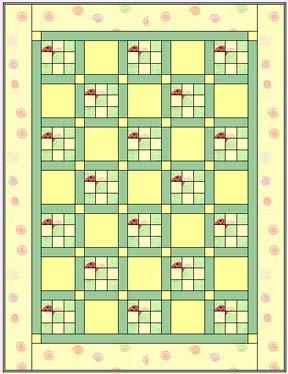 Strip-piecing is a fast, easy method of assembling patchwork blocks for quilting. Using a rotary cutter and a straight rule, you cut long strips of fabric, sew them together, and cut them again to begin forming patterns instead of cutting separate shapes to piece. 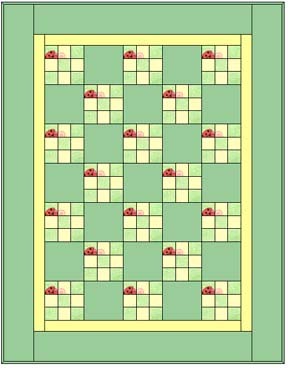 The nine-patch is not a difficult block, but with this technique you can piece it quickly and have perfect corner-matching. It's easiest to make nine-patches in "sets". For each set you need four equal length strips of a patterned fabric, and four strips of a contrasting fabric. Try not to use fabrics that match each other, you want the squares to show up against each other and make a pattern. For a 4 1/2" finished block cut strips 2 inches wide. (Finished means when it is placed into a quilt, the finished size of the block is 4 1/2 inches. Block will measure 5 inches when you measure them before they are sewn into your quilt. This size is called unfinished. ) Cut your strips as long as the fabric will let you, from selvage to selvage. and one with the light fabric in the center. Sew your strips together, right sides facing each other. Press the seams flat to set your stitching, and then press the seams toward the dark fabric (or the darker of the two). When you have sewn and pressed your strips you will have two sections of pieced fabric. Place two sections with more dark light fabric on the outsides, and one section with more light fabric on the inside. You will sew these three together to form one block. Alternate the lights and darks, to make a second set. Now that you have your blocks finished, you can make the quilt. It is very simple, and I will give you a few different settings. First let's do a simple quilt, set with alternating squares of another fabric. You will need 18 nine patch blocks, and 17 solid squares. Your solid squares are cut the same size as your unfinished nine patch blocks, which should measure 5 inches. Alternate your light and dark nine patch squares if you want, or use all the same, either will make a pretty quilt. The inner border on these quilts were cut at two inches, and the outer borders are 4 inches. The finished quilts measure 32 inches by 41 inches. 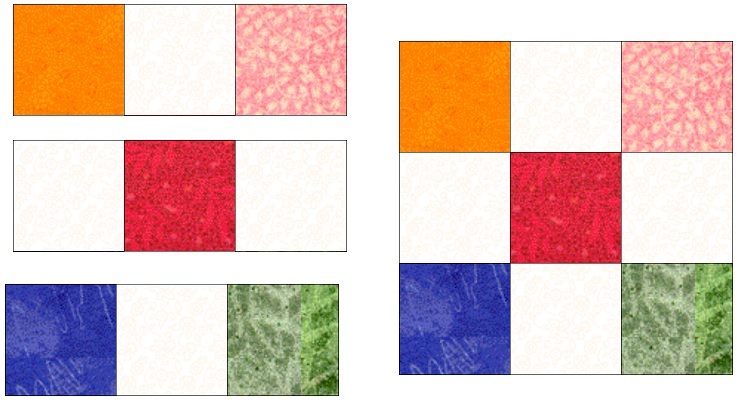 Here are the same blocks, set with different setting blocks and borders. And here are the same blocks with sashing, and sashing and corner blocks. The sashing is cut at two inches, and these quilts finish at 37 inches by 49 inches. 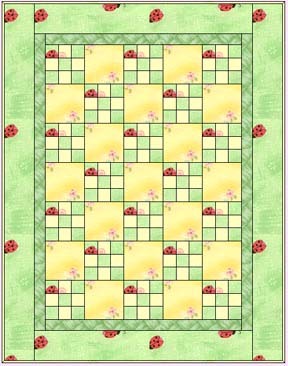 Here's a chart to show you what size to cut your squares or strips to make different size nine-patch blocks. Cutting your squares (or strips) 1 1/2 inches will give you a finished block of 3 inches. 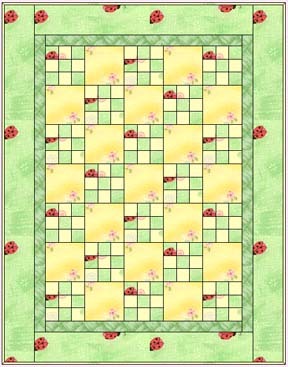 Cutting your squares (or strips) 2 inches will give you a finished block of 4 1/2 inches. Cutting your squares (or strips) 2 1/2 inches will give you a finished block of 6 inches. Cutting your squares (or strips) 3 inches will give you a finished block of 7 1/2 inches. Cutting your squares (or strips) 3 1/2 inches will give you a finished block of 9 inches. Cutting your squares (or strips) 4 inches will give you a finished block of 10 1/2 inches. Cutting your squares (or strips) 4 1/2 inches will give you a finished block of 12 inches. 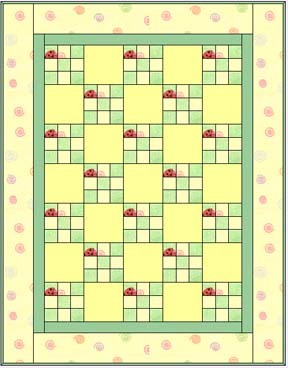 Cutting your squares (or strips) 5 1/2 inches will give you a finished block of 15 inches. Cutting your squares (or strips) 6 1/2 inches will give you a finished block of 18 inches. The content on these pages, including text and images are the sole property of the Delaware Quilts and may not be used or reproduced in any manner without consent. All Rights Reserved.